Something amazing has been happening in Dublin over recent years: a surge in creativity has resulted in a plethora of interesting, unique eateries, watering holes and events and, in this new series, we'll be shining a light on some of my favourite places in town. Check out last week's Hot Spot here. 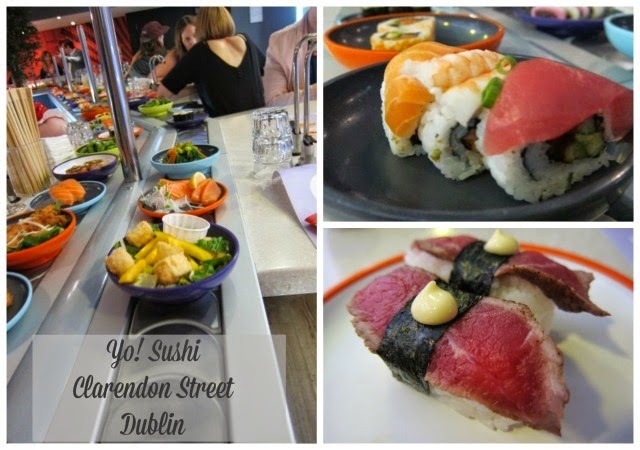 Tucked in behind Brown Thomas, Yo Sushi on Clarendon Street is my go-to spot for some post-shopping sustenance. It's a chain restaurant, so while not perhaps the most authentic sushi in Dublin - I'll share my favourite in a future post - there is so much else to recommend it. I love pretty much everything about this place: the little cups of miso soup and green tea, the still or sparkling water on tap, the assorted silly sounds of the table buzzers, the diner-style booths, fun decor and, most of all, the little coloured plates whizzing past on the conveyor belt. The food is consistently good: my favourites include the veggie firecracker rice, chicken or vegetable gyoza, California hand roll, edamame beans (though I'll be honest: I much prefer these hot) and assorted maki and nagiri - but my current favourite is the Yo! Sushi 'burger'. My god, these things are good. They're also limited, so I dread the day they take them off the menu, but until then I will happily stuff my face with these delicious filled rice patties, €9.50 a pop, served with nori crackers, Asian slaw and some dipping sauce on the side. Of the five available offerings - prawn, chicken, tilapia, salmon or tofu - I've tried the first four, several times over. They each come with different sauces or toppings and my favourite, I think, is the tilapia, which is two pieces of deep fried fish served with cheese and a tartar sauce; it reminds me, not unpleasantly, of a McDonalds Fillet o'Fish. Unlike that creation though, the Yo! Sushi burgers come in at between 300-400 calories each which include the sides, making it a relatively guilt-free indulgence (conveniently ignoring the Sapporo beer I like to wash it down with). Have you had the Yo! Sushi experience?